The components of the vertebral column are collectively made up of the vertebrae and their associated intervertebral discs. It stretches from the cranium to the apex of the coccyx. 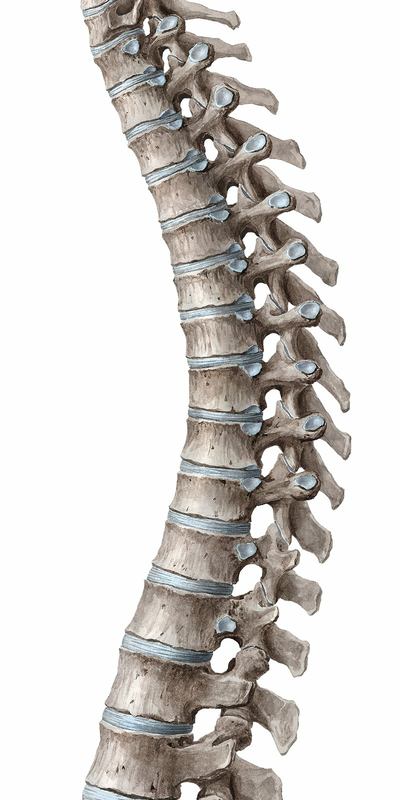 In adults, the vertebral column is about 72–75 cm long, a quarter of the length being formed by the intervertebral discs that bind the vertebrae together. The vertebral column is responsible for the protection of the spinal cord and nerves, and the support of the body’s framework and weight. It also plays an important role in locomotion and posture. The vertebral column or spine is an aggregate structure made up of approximately 33 vertebrae. These vertebrae are subdivided into five groups based on location and morphology. The cervical vertebrae are seven in number and found between the skull and the thorax. They are characterized by their small size and the presence of a foramen in each transverse process. The twelve thoracic vertebrae are present in the thorax, and their vertebral bodies and transverse processes articulate via synovial joints with the ribs. Inferiorly, five lumbar vertebrae are present. They are large in size and provide support for the posterior abdominal wall. The sacral vertebrae are also five in number. They fuse into a single structure called the sacrum. The sacrum joins the pelvic bone on each side and is considered a component of the pelvic wall. Lying inferior to the sacral vertebrae are the coccygeal vertebrae. They are four, but this number can vary from one person to another. The coccygeal vertebrae fuse into a single triangular bone called the coccyx. A typical vertebra is comprised of a vertebral body and posterior vertebral arch. The vertebral body is connected to the adjacent intervertebral discs and ligaments. It is the weight-bearing portion of the vertebra, which causes an increase in its size inferiorly due to the increase in amount of weight supported. The vertebral arch forms the lateral and posterior parts of the vertebral foramen that forms the vertebral canal where the spinal cord lies. The vertebral arch consists of two pedicles and two laminae. The pedicles are bony pillars that attach to the vertebral arch, while the laminae are flat sheets of bone extending from the pedicles to join and form the roof of the vertebral arch. From the junction of the two laminae, a spinous process projects posteriorly and inferiorly. It is a site of attachment for muscles and ligaments. The transverse process, on the other hand, projects from the junction of the pedicle and lamina on each side. It is a site for articulation with the ribs in the thoracic region. The superior and inferior articular processes also arise from the junction of the pedicles and laminae. They articulate with the superior and inferior articular processes of the adjacent vertebrae. Intervertebral discs are fibrocartilaginous cushions that serve as the spine's shock absorbing system. They are made up of the sturdy tire-like annulus fibrosus that encases the gel-like nucleus pulposus center. These discs act as ligaments that bind the vertebrae together, and provide some form of vertebral motion. The vertebral column is responsible for flexion, extension, lateral flexion and extension, and rotation. These ranges of movements vary according to the region and the individual. The vertebral column is supplied by the periosteal and equatorial branches of the major cervical and segmental arteries and their spinal branches. It is innervated by the recurrent meningeal branches of the spinal nerves. Want to learn more about the Vertebral column?